Let's have some real talk for a moment. 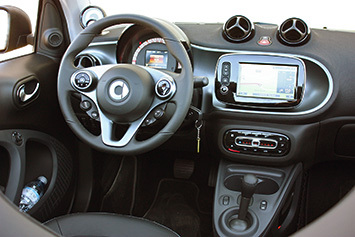 Unless you're part of a very specific, smaller-than-a-Smart-car group of people, the ForTwo makes absolutely no sense for your lifestyle. 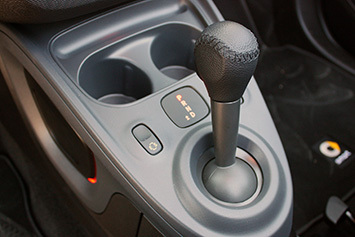 If you're looking for a relatively fun-to-drive, fuel-efficient, functional, and affordable vehicle, you're probably looking at a Honda Fit (or should be, anyway). 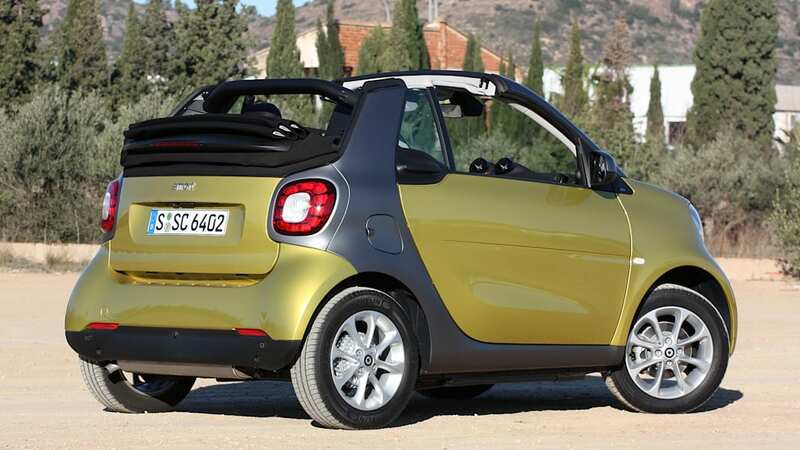 But if you are one of those few folks seeking the daily companionship of a Smart, I offer this advice: Get the Cabriolet. Face it: You're willingly making the choice to sacrifice utility and practicality for something that's easy to park, zippy around town, and – let's be honest – super cute. You're buying an automobile that's more lifestyle accessory than actual car, and you're spending more money than you would on an ordinary B-segment hatchback. So shell out a few extra bucks and get the one that heightens your senses and makes the whole experience more enjoyable. The roof fully opens in 12 seconds flat and can be operated at any speed. 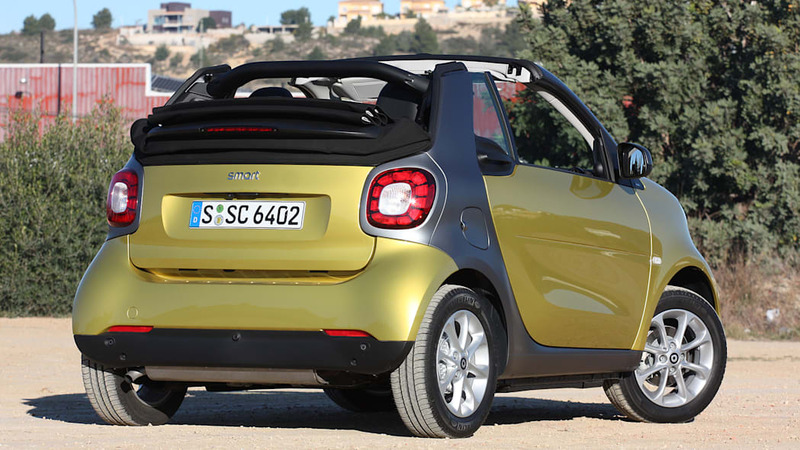 Mechanically, the 2017 ForTwo Cabriolet is identical to its hardtop sibling. 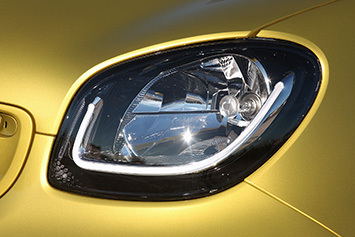 The same turbocharged, 898-cc inline three-cylinder engine is tucked beneath the cargo area, producing the same 89 horsepower and 100 pound-feet of torque. 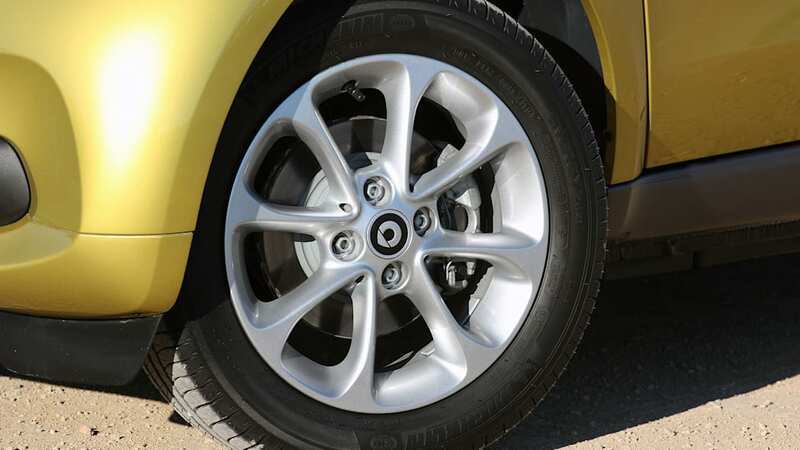 You still get the tiny-tough appearance, with 15-inch wheels pushed to the extremes of all four corners. 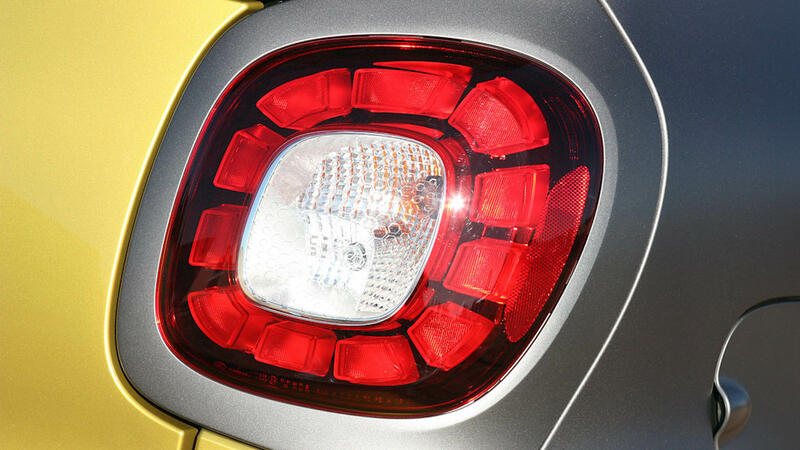 There are still eleventy billion color combinations, with different hues available for the body panels, Tridion shell, and canvas roof. And yes, you still get the hilariously tidy, 22.8-foot turning circle that makes quick u-turns a laugh-out-loud experience. 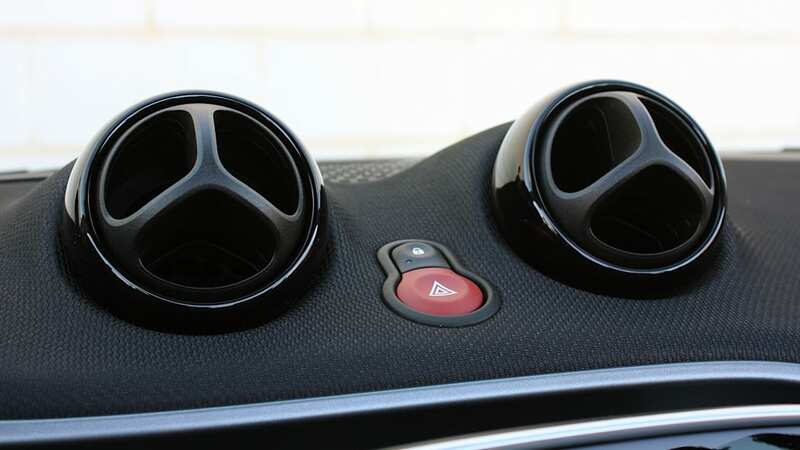 But you also get a roof that slides back with the touch of a button, fully opens in twelve seconds flat, and can be operated at any speed. Slide it all the way back for a big sunroof effect. Keep pushing the button and the canvas will drop down, stacking neatly on top of the cargo bay. 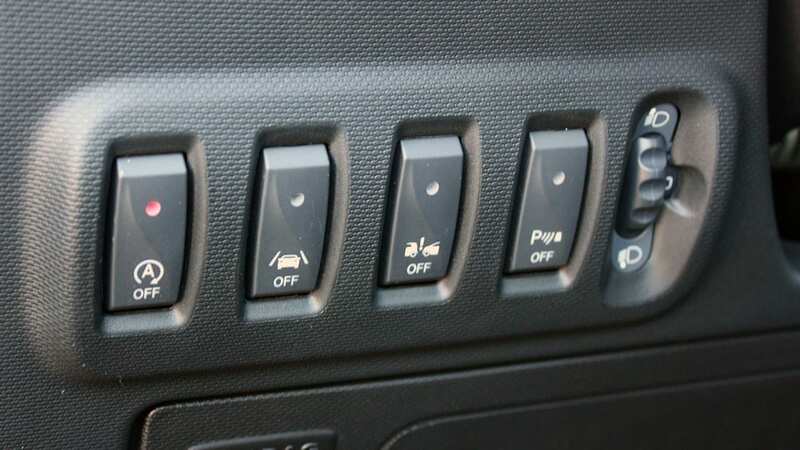 And don't just stop there – drop the windows, hop out, remove the side roof panels, and neatly stow them in the built-in storage space inside the fold-down tailgate. No matter how you strip down, it's all super easy. See for yourself in the video below. 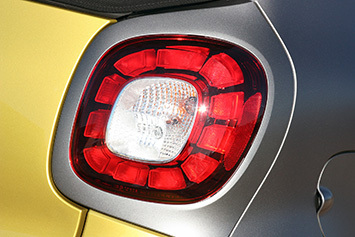 With the roof in its fully retracted position, rear visibility is pretty lousy. Of course, there are a few drawbacks. With the roof in its fully retracted position, rear visibility is pretty lousy; the rear-view mirror is basically useless. 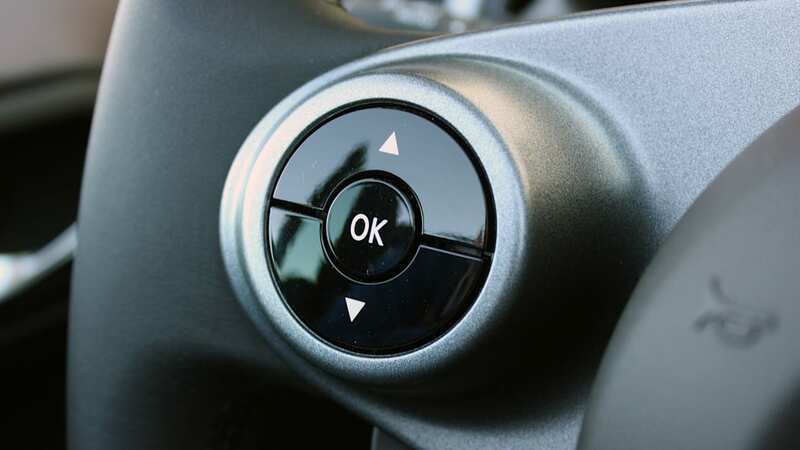 Thankfully, there's a back-up camera built into the optional navigation head unit that'll help you see what's behind you when reversing, should your backward view be compromised. 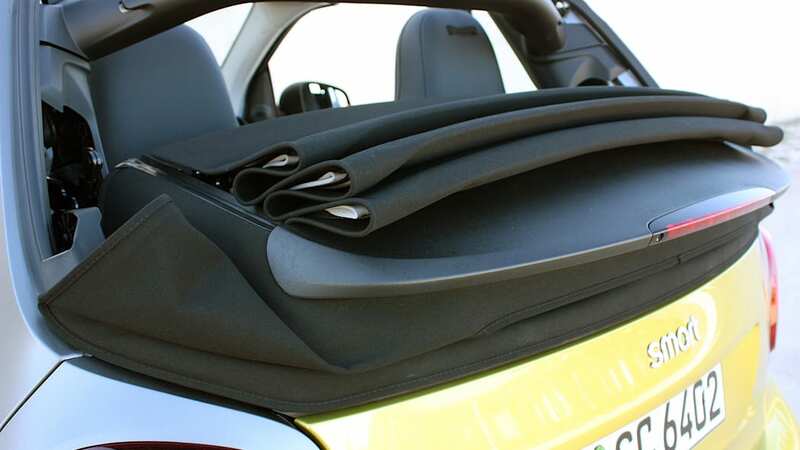 Beyond that, there's the issue of the roof panels cutting into the already limited cargo space. 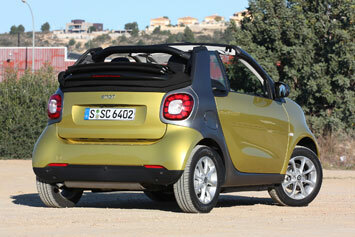 With the top up, the Smart Cabrio has 12 cubic feet of storage. And while the roof itself doesn't intrude on that, stowing the side panels takes away three cubic feet of precious cargo area. That's 25 percent of the available room. 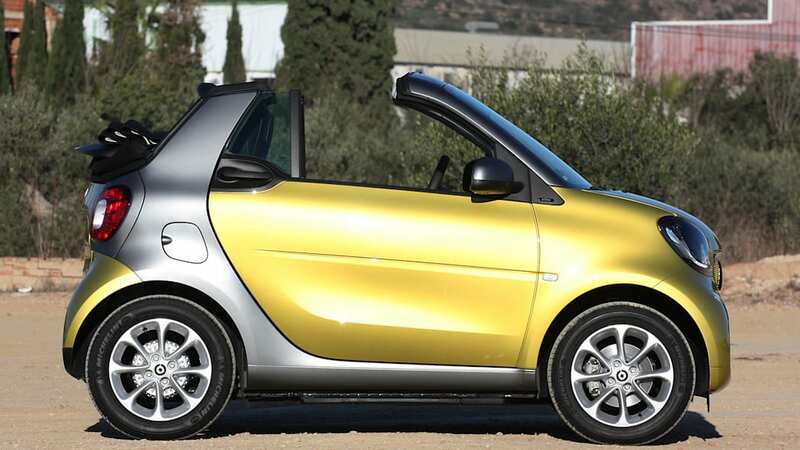 Then again, it's not like you're buying a Smart for its capaciousness, right? 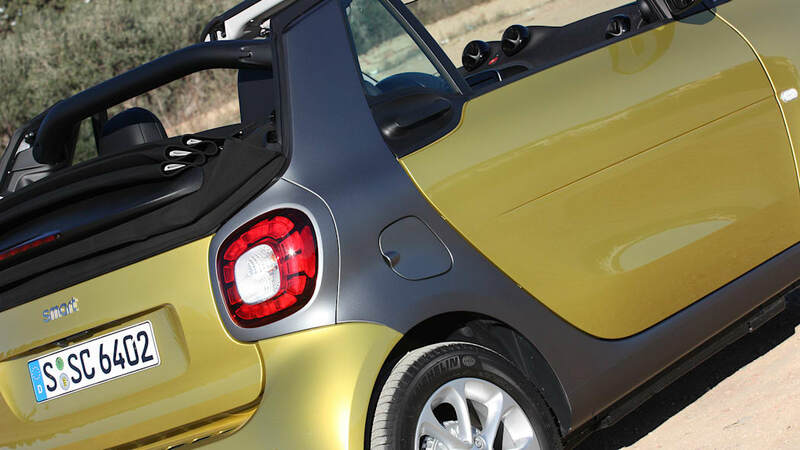 The power roof mechanism adds a little under 200 pounds to the Smart's curb weight – which is a lot, considering how small this car is – but you won't notice the extra heft. 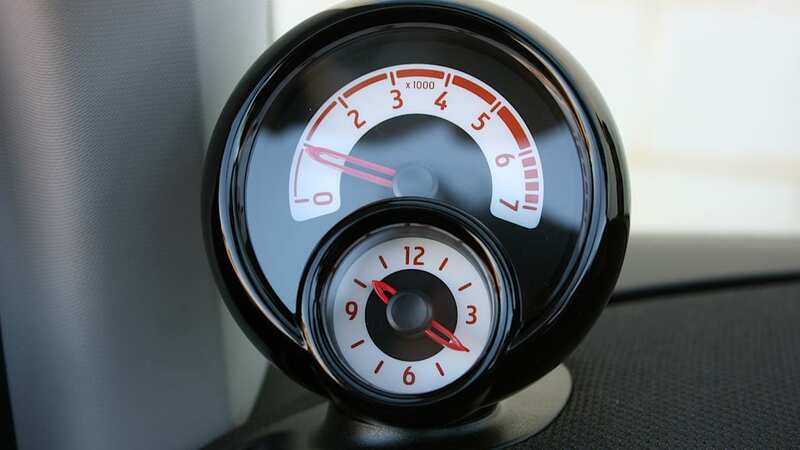 After all, it's not like the coupe is a quick little guy, what with its 10.5-second 0–60 sprint. 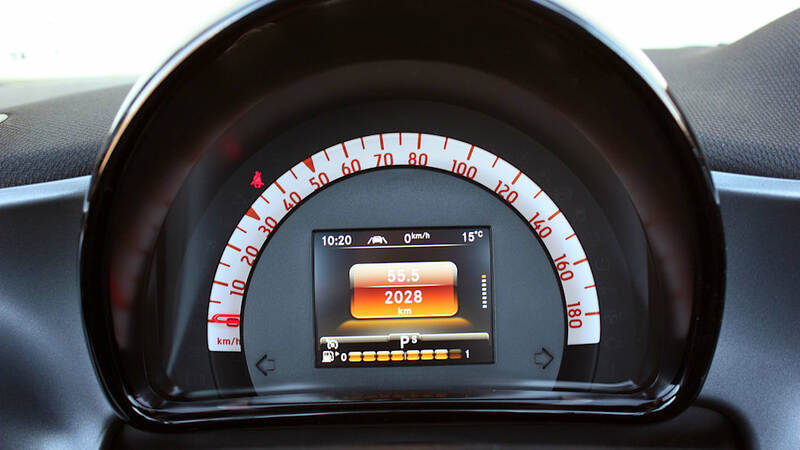 The Cabrio adds a full second to that acceleration time, but it's not inappropriately slow around town – the turbocharged engine has decent mid-range punch for urban driving. Yes, the Smart feels out of breath at times on the highway, and getting up to speed on entrance ramps is quite the production. 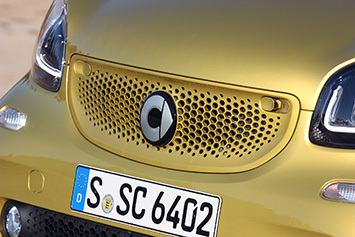 Of course, if frequent freeway use is in your future, you probably shouldn't be looking at a ForTwo to begin with. 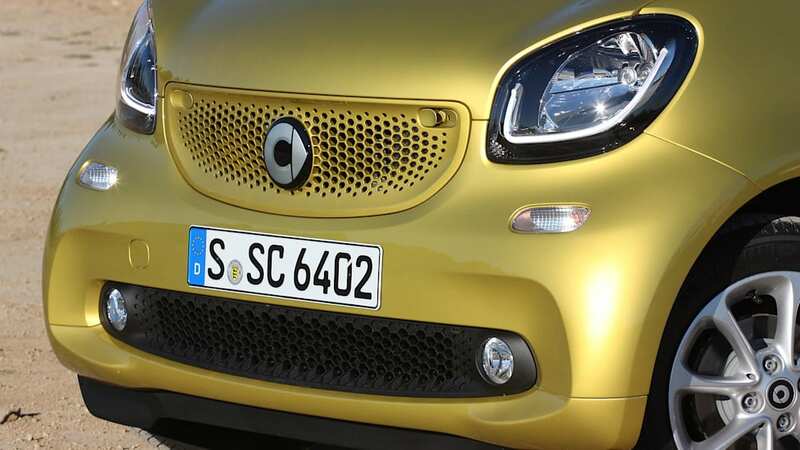 Mercedes' Crosswind Assist system keeps things stable at higher speed, so the ForTwo's tiny footprint is still glued to the road. 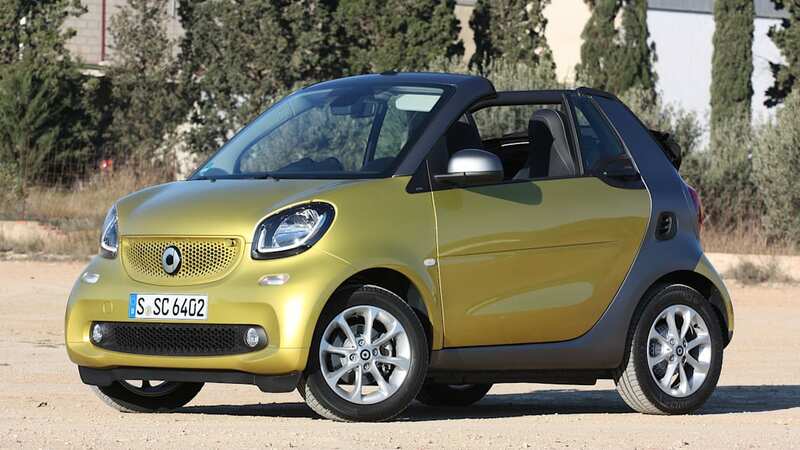 Smart won't sell you a ForTwo Cabriolet with the five-speed manual transmission, which is a bummer. 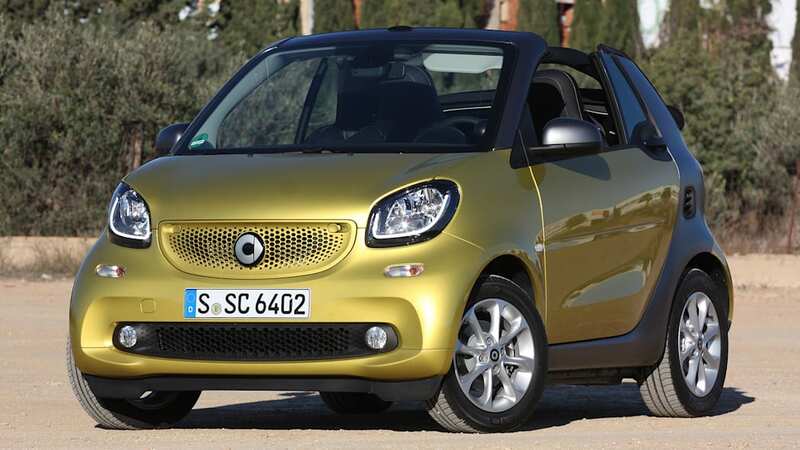 I like the stick-shift setup in the Smart coupe, and the idea of rowing my own during open-top microcar motoring sounds delightful. 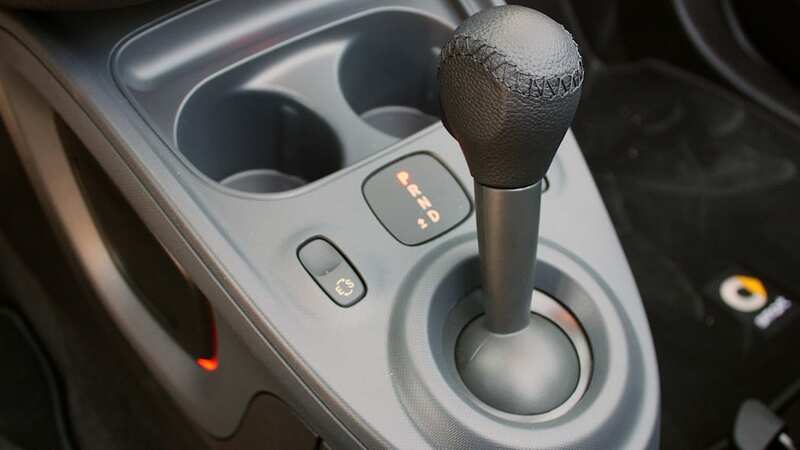 The Twinamic six-speed, dual-clutch transmission isn't a total buzzkill – not like the godforsaken automated manual of the old ForTwo, anyway – but it's sometimes slow to respond and not always confident about what gear it wants to be in, and when. 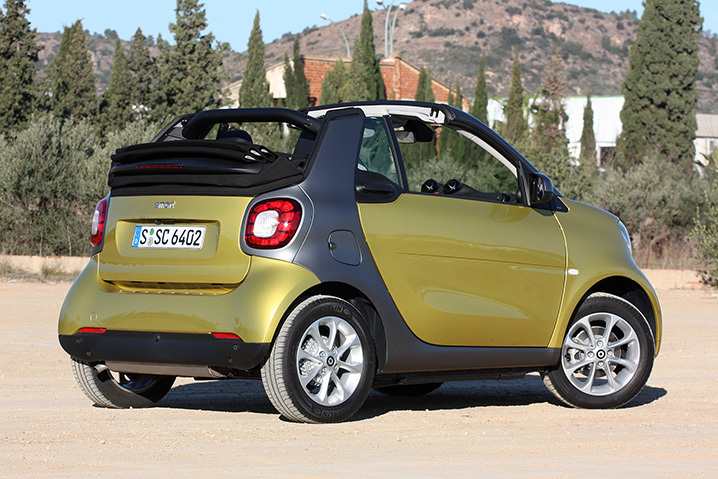 Still, with the top rolled back, bombing around in the Smart is an easy-breezy experience. 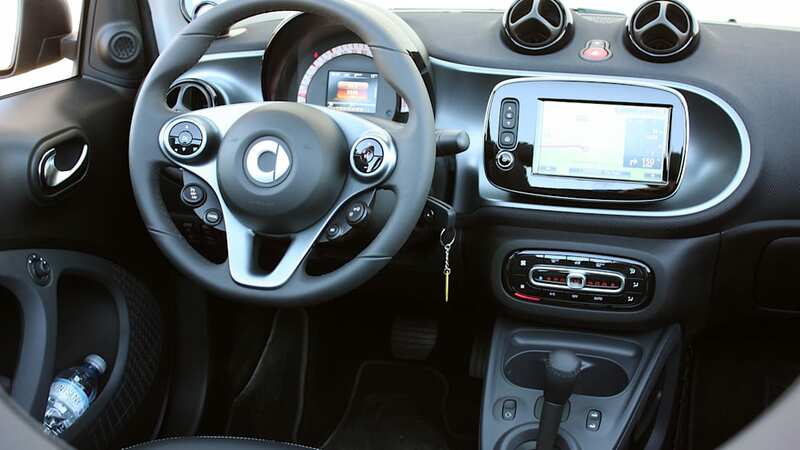 It's like driving an adult-sized Cozy Coupe with unlimited headroom. 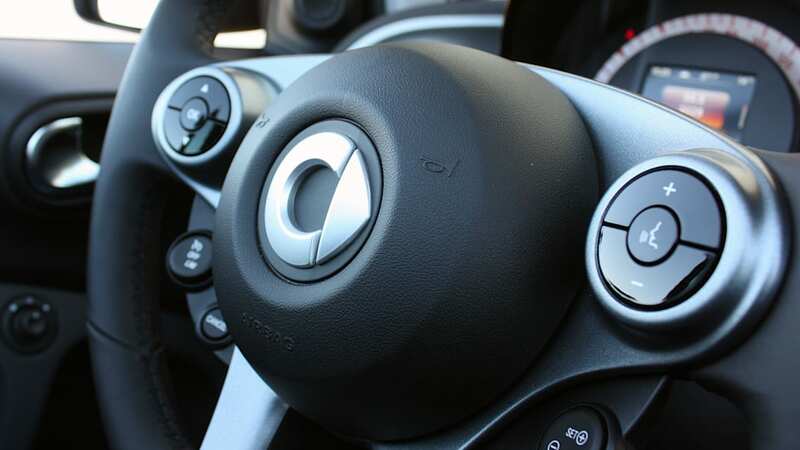 The steering is light and crisp, though there's a noticeable lack of road feel. 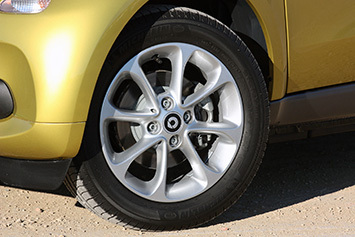 The ride is compliant over broken pavement, the 165/65-series tires and relatively soft suspension soaking up most minor imperfections. The car pitches and dives, and there's plenty of roll when cornering hard, but it's all in good fun. This isn't a sports car, and it's not trying to be. 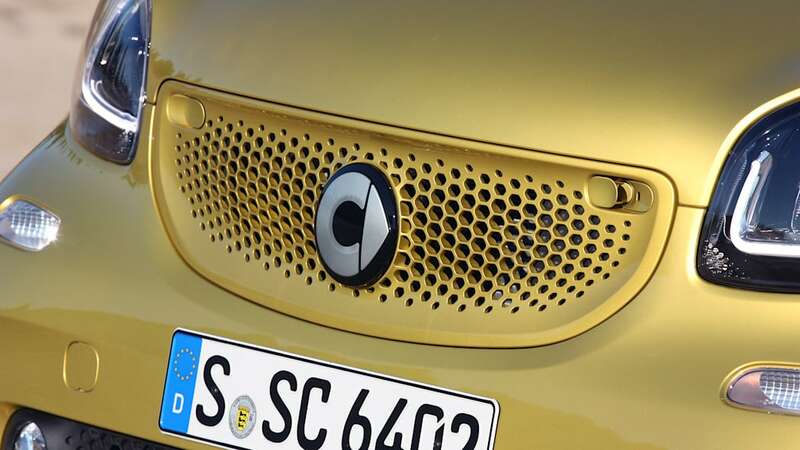 On the other hand, it's not a flimsy, topsy-turvy thing, either – Mercedes' Crosswind Assist system keeps things stable at higher speed, so the ForTwo's tiny footprint is still glued to the road. Legroom is ample, and headroom is totally fine, even with the roof closed. Inside, there's room for two (hey...) with plenty of clever little storage compartments and a few cup holders for your beverages. 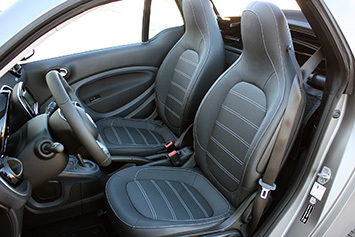 The seats are fine for short drives, but don't offer much support. 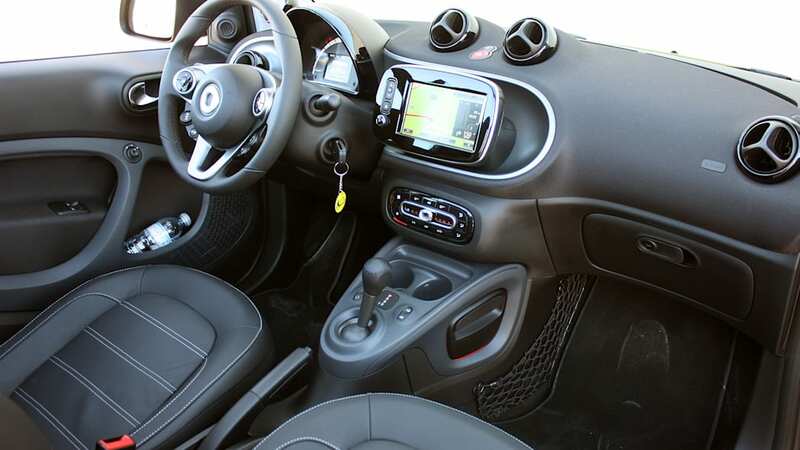 That said, taller friends won't have any trouble getting comfortable inside the ForTwo – legroom is ample, and headroom is totally fine, even with the roof closed. The Smart Media System is a nice upgrade from the phone-based Cross Connect App I tested previously, but it still has issues. 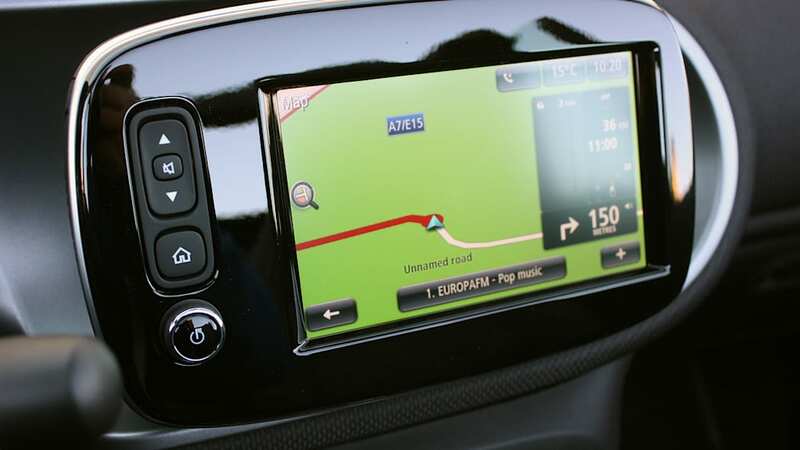 The TomTom-sourced navigation software is clunky and can't always keep up. 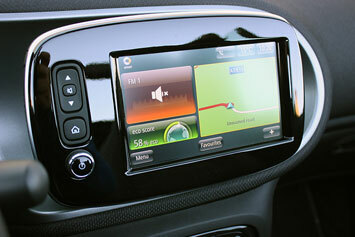 Plus, the menus and controls aren't very intuitive. While driving through the city center of Valencia, Spain (great place, by the way – try the paella) the nav was more hassle than anything else, and I commonly relied on my iPhone's Apple Maps app to properly navigate around. 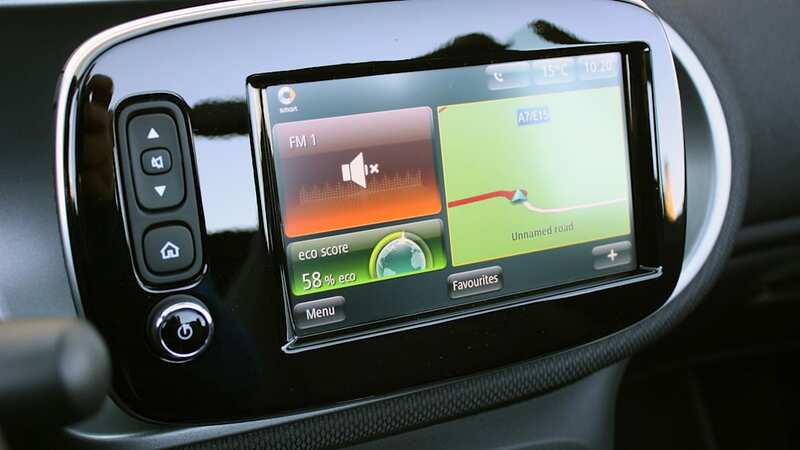 At that point, I'd just as well stick with the less-expensive Cross Connect option, but I like the uniform look of the seven-inch touchscreen more than the clunky phone dock sticking out of the radio head unit. The added enjoyment of opening the roof and having a fully open-air experience seems like a no-brainer. 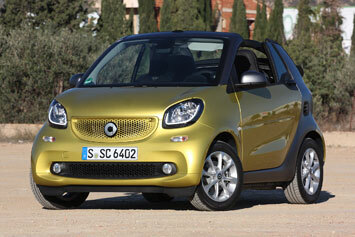 The ForTwo Cabrio will arrive at dealers just in time for summer. 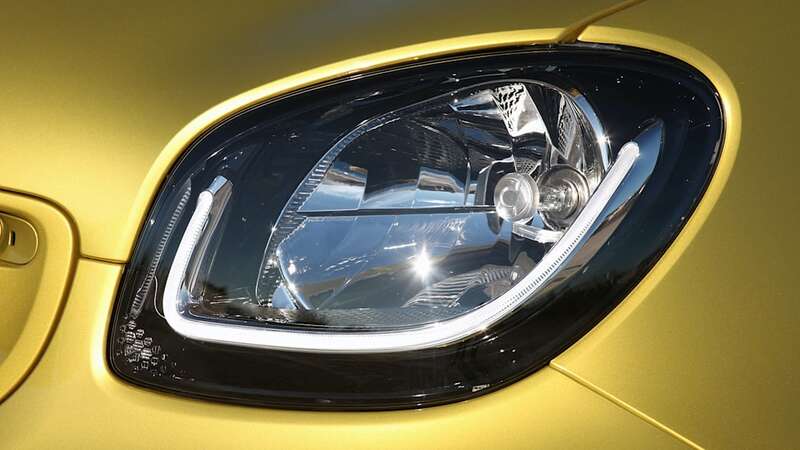 Pricing isn't available as of this writing, but expect the convertible models to command a few thousand dollars more than the equivalent coupes. That means a top-level Proxy trim should land right around $23,000, all in. 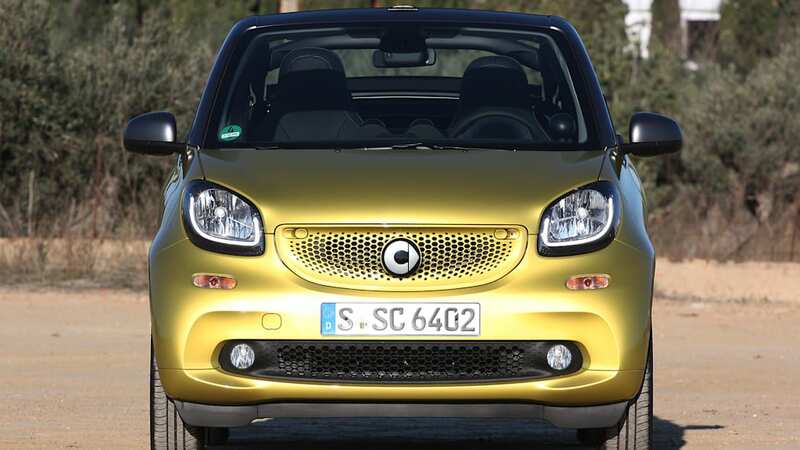 That's a lot of money for such a tiny, compromised car, but Smart boss Dr. Annette Winkler says the brand "is very much premium." In the previous generation, the take rate of higher trims and expensive options was "really high," she says, and Smart expects this trend to continue. 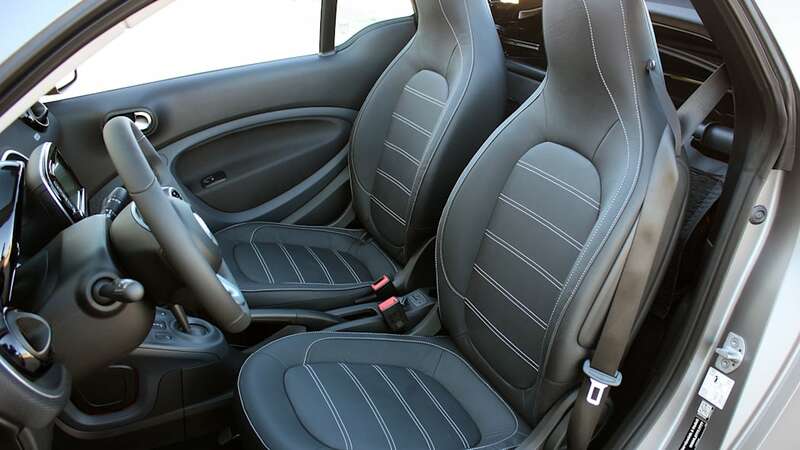 Besides, it's not like you can get a ragtop Fiat 500c for less than $20,000 anyway. But back to my original point: No one buying this car is doing so because it makes sense from a value proposition. It's in no way a rational choice, but rather an emotional one. 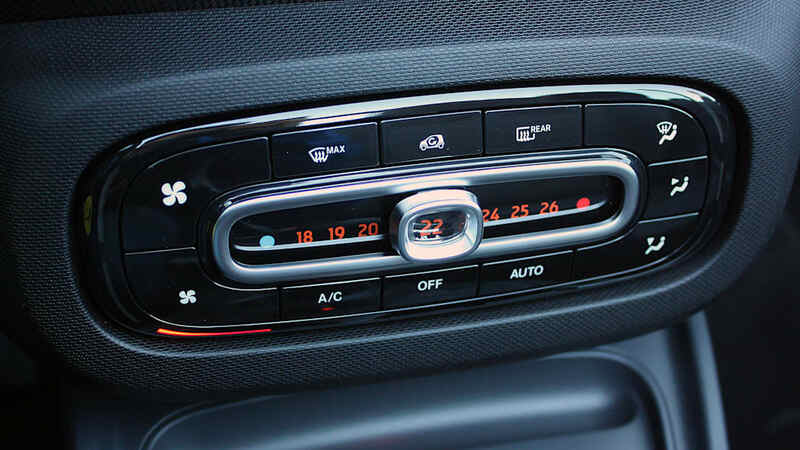 To that end, the added enjoyment of opening the roof and having a fully open-air experience seems like a no-brainer. If you're going Smart, live a little, and go all in. 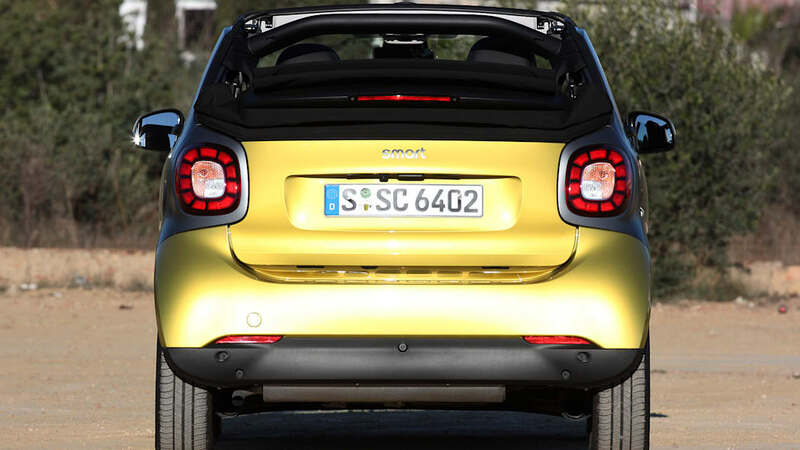 The Cabrio is the one you want.